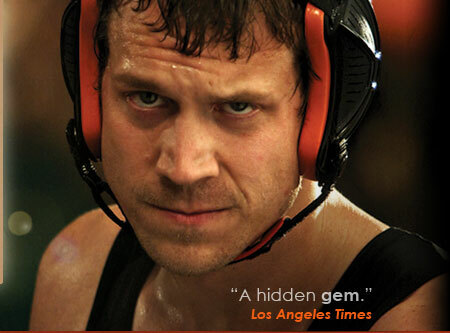 Russell Harvard has appeared in many TV Shows in the past and recently took on the main role of playing Matt Hamill in "Hammer". Russell was kind enough to talk with MMA Disputed about his role and what it took to prepare to become a MMA fighter. The directors have said they wanted to look into having deaf actors play the roles of Matt Hamill’s real life counterparts. How did the role come into fruition? Originally I auditioned for the role of Jay but in my mind I felt I should play Matt. Nearly a year later, they asked me to audition for role of Matt and I did. The next thing you I knew, Oren Kaplan asked me if I wanted to play Matt. BOOM! I told them I was in and how much I wanted the role. I just wish I had more time in preparing myself physically but I'm content with the final production of the film. Before you took the role as Matt, did you have any idea what MMA was or was that something you researched while preparing for the film? I have heard very little about the UFC. After I graduated from Gallauduet University in 2007, I then learned that there would be a deaf individual on the Ultimate Fighter. One thing I can tell you is that the moment I worked on the walking out scene towards the cage among other fighters who were fighting in the preliminary fights in Las Vegas, I had the opportunity to see some fights live and I was shot up with adrenaline. There’s something about watching the UFC live rather than on TV. How difficult was the wrestling scenes to film and learning the exact moves that had to take place? They were difficult but I'm glad it wasn't theatre work which would be done live. I've injured both of my thumbs when attempting a move. I made some bad moves when I’m training and that’s how I learn. I even asked the stunt coordinator to allow an opponent to slam me hard on the mat so I could just understand the feeling of it. PAIN at first then you just get used to it. How much interaction and talking did you do with Matt in order to play the role to perfection? Matt and I did not have much time for interaction as I would have hoped. He was training for UFC and I was busy working out and training for the film. I met with Kristi Hamill who helped me visualize and understand what he was like as a person. I think it is effective both ways to get to know the person in real life is through the person themselves and their family or friends.